This remarkable true story begins in a Brooklyn ghetto when a group of Canadians meet Lesra, an illiterate black teenager who won their hearts. They bring Lesra to Toronto to help with his education. While learning to read, Lesra finds a copy of Rubin Carter's The Sixteenth Round. Rubin Carter, the subject of Bob Dylan's song "Hurricane", was a #1 middleweight boxing contender who had been wrongfully imprisoned after a white jury found him guilty of the murder of three whites in 1966. A huge public outcry followed the publication of Carter's memoir The Sixteenth Round in 1974, culminating in a retrial, which was a virtual reenactment of the original travesty, with Carter receiving the same triple-life sentence. Inspired by Lesra's passion, his adopted Canadian family made contact with Carter and reinvigorated the legal battle. 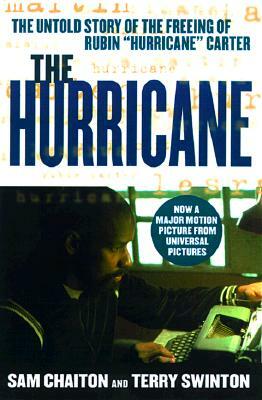 The Hurricane is the moving story of the eight year struggle Carter and his Canadian friends waged to win his exoneration and freedom. Keywords: JUSTICE. PRISON. NEW JERSEY. GHETTO. RUBIN CARTER. BOXING. CRIMINAL CRIME. COURTS.